‘Viesti’ (Relay) 2009. Video still. Viesti (Relay) is performance that took place at the ANTI- public art and performance festival in North-Eastern Finland in September 2008. Kuopio is a fairly provincial, socially conservative and sports oriented city. We found the legendary Väinölänniemi sports stadium an interesting place for the performance; sports’ heroes such as Paavo Nurmi have broken records here. Today the stadium is out of the limelight, since a new, covered stadium has been built elsewhere in the city. School classes, hobbyists and low-level football teams now practice in the stadium. 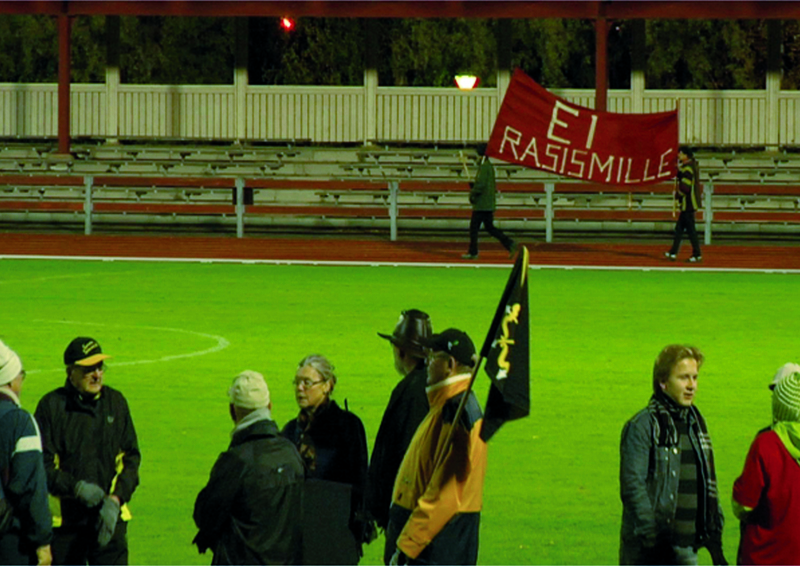 For the performance we invited eight groups and/or individuals from Kuopio to manifest a cause by running a lap of honour at the Stadium. We paired the groups, as one group runs, another group talks about the running group’s issue; for example the University Student Group runs, as the group for the preservation of the cultural centre for the feminist writer Minna Canth speaks about the importance of free education. Atik Ismail, a local social worker who is known as a writer, Green and Left party candidate and a professional footballer, moderated the event together with us. A song, assembled from statements given by the participants, was recorded before the performance together with the Berlin-based musicians Miss Le Bomb and Fred Bigot. We invited groups/individuals to participate in the performance, which we felt were not very visible in Kuopio. We were curious to see to whether people were ready to appear in a real time public event to physically manifest for their causes. It’s a vague reference to the Rainbow coalition, a US movement in the 1960s and 1970s, where different (socialist) groups unified. Viesti (Relay) was produced from the performance’s documentation. The videos uses a split screen to show the running and speaking groups simultaneously, and uses to the conventions of filming a sports’ event. The generic setting of the stadium is in tension with the local social thoughts delivered by the individuals/groups.